Johns Hopkins anatomy professor Christopher Ruff, Ph.D., says there’s a funny thing about mobile apps meant to educate students on musculoskeletal anatomy: A lot of the anatomy images used are wrong. 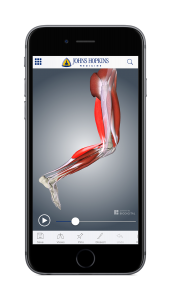 That’s why Ruff is excited about Muscle Anatomy: A Johns Hopkins Medicine 3D App, built and powered by biomedical visualization company BioDigital. The anatomical renditions were pulled from BioDigital’s image stock and meticulously reviewed and enhanced based on Ruff’s feedback. The app boasts more than 3,000 anatomy structures grouped into four regions: head and neck, upper limbs, trunk, and lower limbs. Users can spin, tilt, dissect, write on and highlight different areas of the body. They can also tap on anatomical labels to reveal educational information or use the ‘X-ray option’ to see a more transparent version that reveals three-dimensional positioning. Getting Muscle Anatomy from concept to the marketplace took nearly two years. The development journey began when a former student in the world-renown Johns Hopkins Art as Applied to Medicine department, who now works at BioDigital, contacted Ruff for feedback on musculoskeletal renditions she was drawing. They got to talking. One thing led to another. And the idea for the app came shortly after. Working closely with BioDigital was an education for Ruff, who directs the Center for Functional Anatomy and Evolution at the Johns Hopkins University School of Medicine. “I deal with tangible materials like fossil vertebrates and recent human remains. So guiding an artist to get everything to look exactly right and correctly positioned in a digital environment was the biggest challenge,” says Ruff. Check out other educational Johns Hopkins mobile apps like the Osler Medicine Survival Guide, a point-of-care tool for students and house staff, and the Johns Hopkins Atlas of Pancreatic Pathology, a teaching atlas with images, flashcards, and an image-based quiz.